With a winning bid of 1.2 million euros, Revolution broke the record for all German stallion auctions at the Hanoverian licensing in Verden in the autumn of 2015 where he was awarded premium stallion. The following year, he was shown impressively at the Danish Warmblood licensing and once again awarded premium stallion. In 2016, Revolution was the sovereign winner of DWB's 35-days performance test with a total score of 9,77 points - with no less than seven 10's. 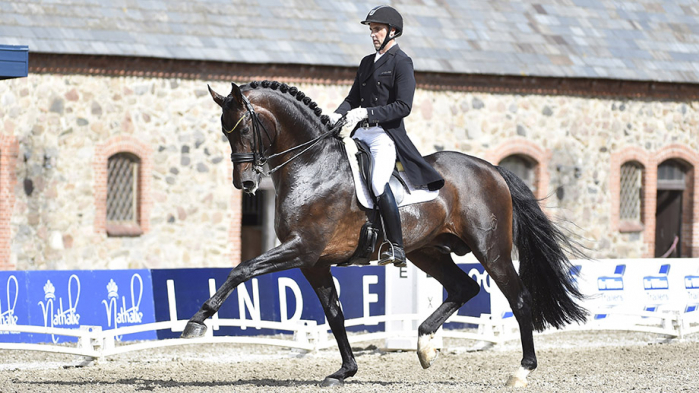 In 2017, he was the champion stallion in DWB and won the Danish championship for 4-year-olds with four 10’s out of five scores. Finally in 2018, Revolution won the world championship for 5-year-olds in Ermelo with a total score of 9,62 and among that 10 for canter, 9,8 for trot, 9 for walk and 9,3 for submission and perspective. Revolution is a high-set, elegant and modern stallion with three fantastic basic gaits and a wonderful temperament - he is an ideal modern sports horse. The first crops from Revolution have shown that he inherits the long-legged modern type and gives his offspring three big gaits, which make the foals very attractive on the foal auctions all around Europe. The sire of Revolution, the premium stallion Rocky Lee, is considered one of the best sons by the top stallion Rock Forever, who is already an established name in international horse breeding owing it to top-notch sons and daughters. The dam sire Rouletto, who was successful in S dressage, is known for his offspring with good rideability at top level. The dam of Revolution, Rochelle made her debut on the international tribune with this amazing son. Revolution is licensed in DWB, OLD, HANN, WESTPH, Süddt. Verbände, Mecklenburg, Rheinland. Revolution is stationed at Helgstrand Dressage.